We want to extend a huge THANK YOU to the Community Betterment Foundation, Alexandria Bay. 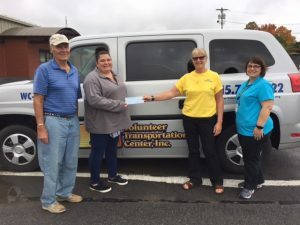 The Foundation recently made a $1,500 donation to Volunteer Transportation Center’s wheelchair accessible program supporting non-emergent medical transportation for seniors and persons with disabilities in Jefferson County.. Shown, from left, are Royal (Bud) Garlock, VTC Transportation Coordinator Tammy Fulmer, Heather McKinnon Heath, and VTC Development Director Jennifer Hodge. If you’re interested in making a tax-deductible gift, please reach out to us at 315-788-0422 or via our Facebook page!